and I'm so happy you're here. So what do you think my SUPERPOWER is? Well, I'm not even sure I know! Have you ever heard of someone referred to as "A Jack of all trades, master of none"? My mother and grandmother have said it often. Maybe that's me. 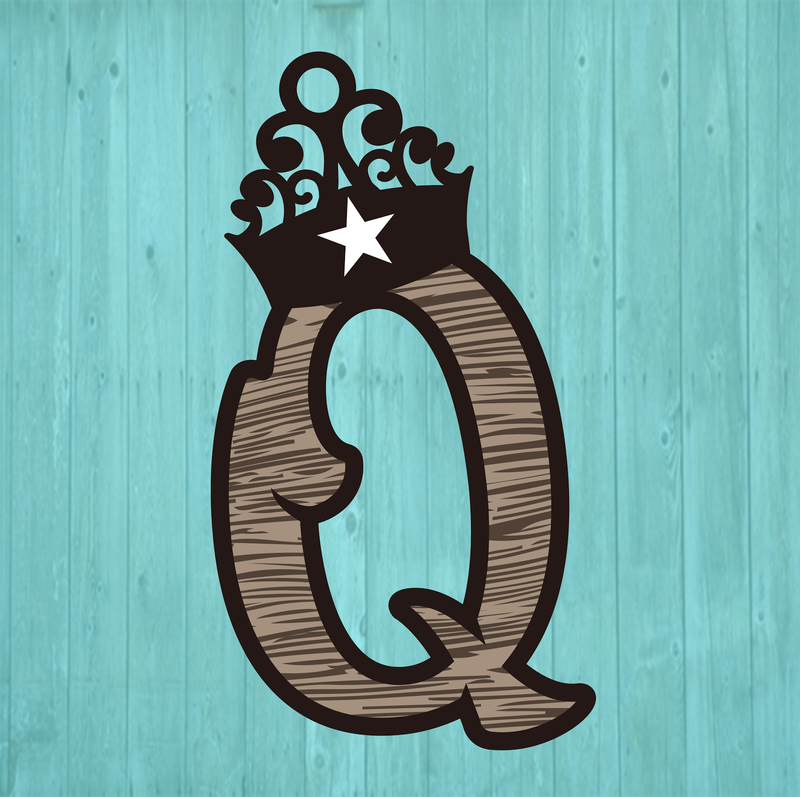 A Jack Queen of all trades, master of none many! I think my SUPERPOWER has changed over the years. At one time I think I could say my SUPERPOWER was counted cross stitch. I certainly did my share of it back in the late 80's and early 90's. Here are a few of the things I did. My greatest accomplishment is a Precious Moments counted cross stitch quilt I started for Hollie when she was a little girl. My mother told me I'd be lucky if I finished it by the time she graduated high school. I've never been a lucky girl! But I did finish it when she was 22; just before my first granddaughter was born! I'm not sure who that quilt was for; me, Hollie, or Raleigh! 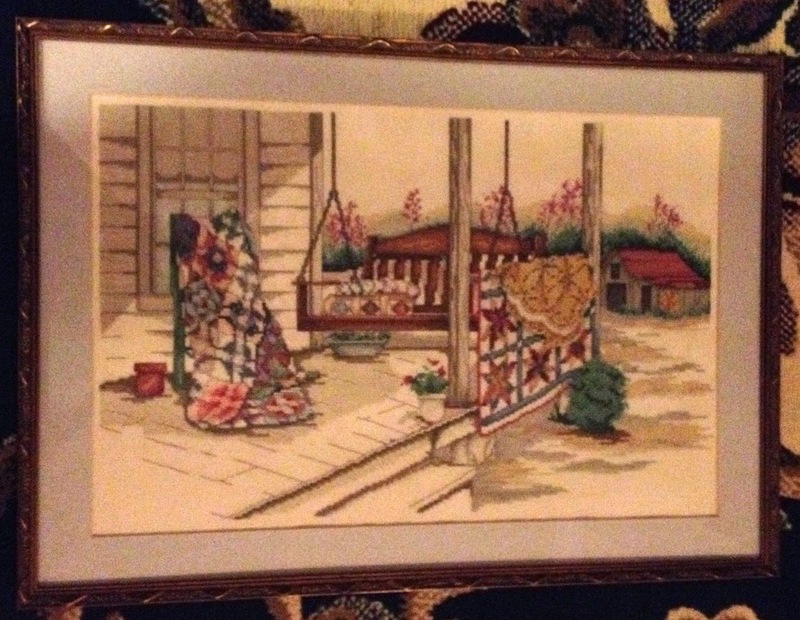 Sorry no picture, the quilt is in Japan when Hollie resides at the time. 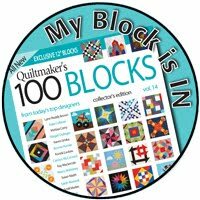 I did however, run across one of the blocks for the quilt. I knew I had it almost finished and couldn't find it anywhere. After I started the block again and finished the quilt, of course, I found it. See, I knew I was almost finished with it. That was a lot of work to do over again! Here are a few other things I cross stitched. 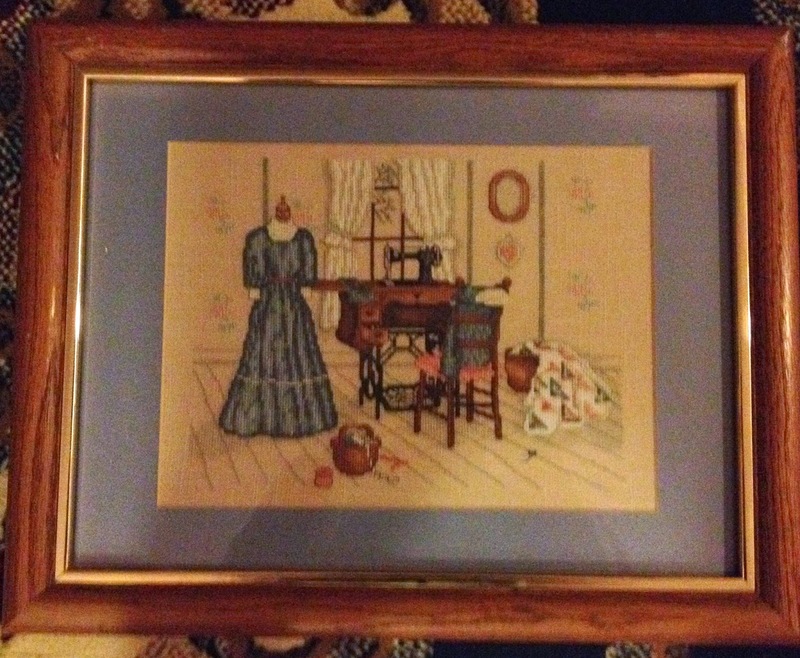 I cross stitched quite a few Paula Vaughn designs. This one and the next one are a set and were my first attempt on linen. Paula Vaughn again. 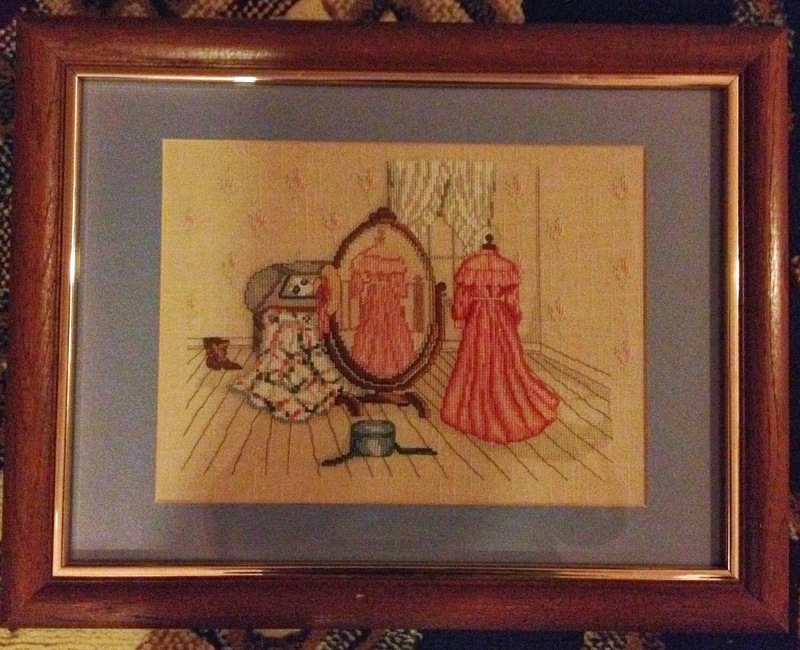 And I recently picked up some cross stitch again with this project from Little Miss Shabby. It's going to be a sampler quilt. There will be 16 blocks in it. Needless to say, I'm a little behind. Block 6 just came out. However, cross stitch isn't my SUPERPOWER any more. Apparently I don't know how to count. I can't tell you how many times I've had to un-stitch because I counted wrong. Urgh! In the last few years, I've picked up embroidery. I don't think I can say that's my SUPERPOWER either. I'm really not that great at it. I only know a few stitches. I'm somewhat well know for my Texas Quilts obsession collection and this quilt is what sparked my interest in embroidery again. And here are a few other embroidery quilt projects I've done. 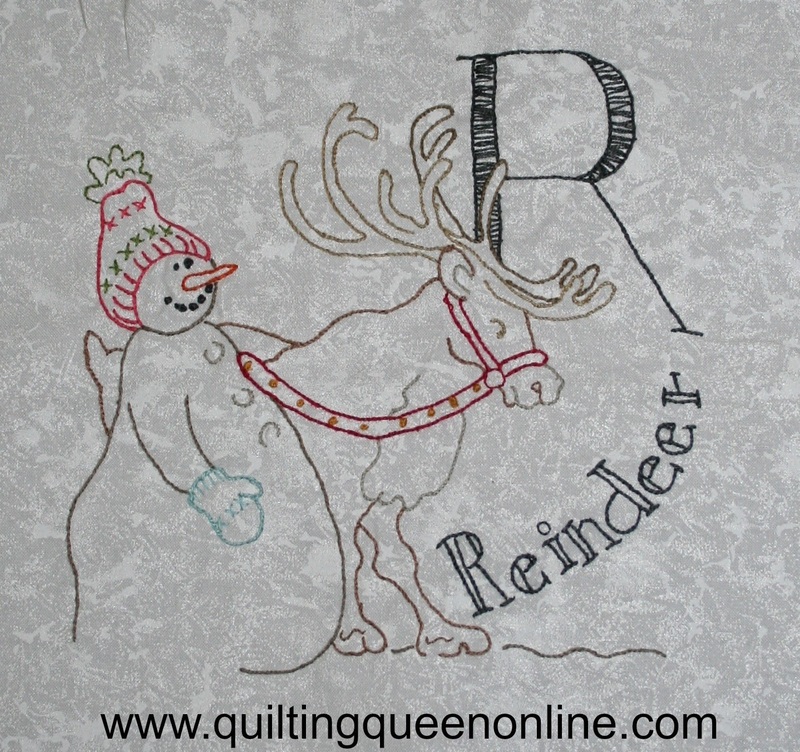 I was hoping this blog hop would make me kick it in high gear and get this Snowman A-Z Embroidery Quilt finished but there was just too many irons in the fire and it just didn't happen. I did get a couple more blocks finished though. So WHAT is my SUPERPOWER? Well, I think it's quilting.... of course! And I bet you would have never guessed that in a million years, right? I've always quilted (never by hand though). I created this table topper/wall hanging for my mom. I snitched the doily from her dresser drawer and this is what I did with it. 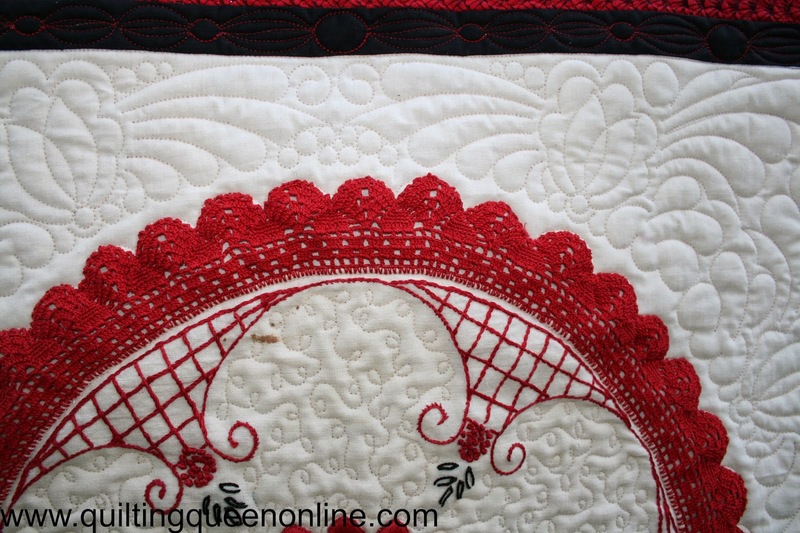 I appliqued the lace edging on by hand and then used invisible thread (clear mono filament thread) and stitched it down around the center medallion and the inner edge of the red crocheted lace. Someone had some STITCHING SUPERPOWERS! Just look at the embroidery on this and the crocheted edging. Now that's some SUPERPOWERS! 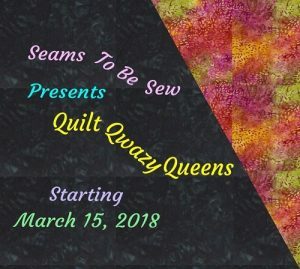 I added my SUPERPOWER quilting and tah dah! 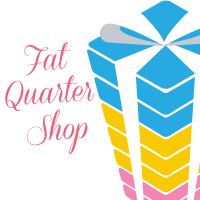 Many, many thanks to those who made this blog hop possible. The one, the only, Madamme Samm at Sew We Quilt and our SUPER cheerleader Pauline at Quilt n Queen (the other Queen and her Palace) and of course DMC Embroidery. Now how about a SUPER GIVEAWAY. 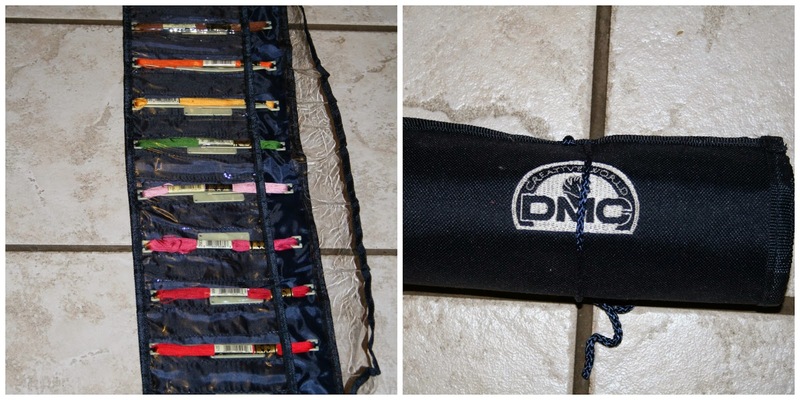 I'll be giving someone this floss organizer. Just leave me a comment and tell me what your SUPERPOWER is. Of course, you can increase your chances if you follow me on Facebook or Twitter; leave me a comment and tell me so. AND I'll double your entry if you share it on Facebook or Twitter. Now put on your SUPERMAN WONDER WOMAN SUPERPOWER cape and see what other SUPERPOWERS there are being stitched up. I hope you enjoy the remainder of the blog hop. I don't think of myself with superpowers, I do cross stitch and quilt and garment sew. I think raising 3 kids as a single parent took more power and going into my 'golden' years has me re-learning many things. 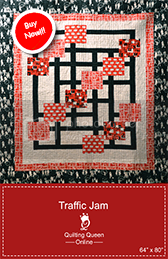 So loving your quilting and cross stitching projects. Sew very lovely! Thanks for the inspiration! Love all the projects you have done! Thank you for sharing. I guess my superpower is quilting. I love your projects. 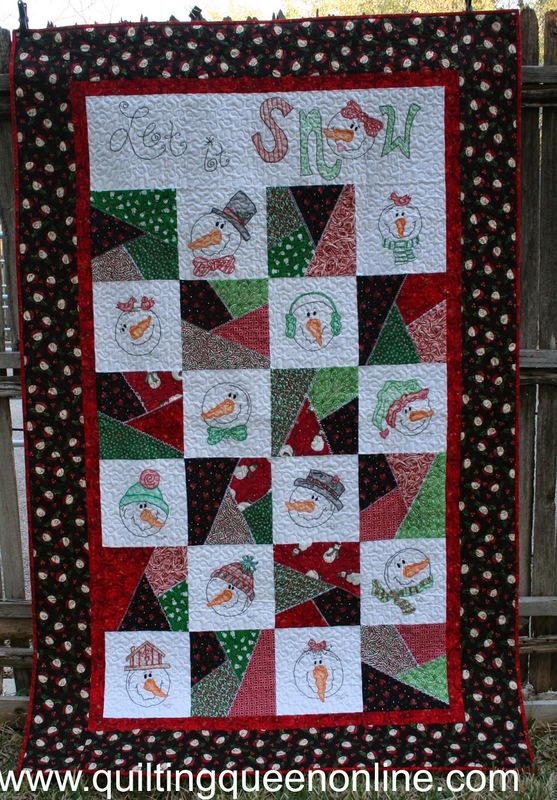 The quilt with the dolly is so cute. My superpower is to cooking. I love looking at cross stitch projects. Those framed scenes are amazing. Your quilts and quilting are super. You have some great super powers. J love your finishes and achievements. I'd say cross-stitch, embroidery, and quilting are ALL your superpowers! All your projects are wonderful. You do have many super powers lady! All of your pieces are gorgeous! All lovely items, and what a clever idea with the cross stitch BOM using EQ! Each and every piece is beautiful...but I love your quilting. now maybe that is because quilting is my super power too!! But I connect with you beautiful quilting!! Not sure if this is a super power but organization would have to be it. I am the mother of 4 (3 of which are triplets). I had to become VERY organized when all of them were little. Now my boss would say that is what she loves about me also. Thanks for the giveaway and I love all of your projects. Quilting is certainly your superpower..... They are lovely. Yay for a quilting superpower though I think you can count embroidery among your "supers" as well! Great projects! WOW! I would say quilting is definitely your super power. It is beautiful. LOVE the way your doily project came out. It is very pretty and a great way to keep treasured linens. I love the "Queen of all trades..." quote--too funny and so true for me. You totally showed some superpowers with your cross stitching and embroidery (I only know a couple stitches, too.) That wall hanging/table topper is absolutely gorgeous! How beautiful! All of them!! Congratulations on being a top pick today. You are certainly deserving of that! I can't reveal my superpower until the last day of the hop! love all of your projects....your embroidery is beautiful...my super power may be a helper....I love to help people...thanks for the giveaway.. Your stitching is gorgeous.You truly do have a stitching superpower. Super great. I love the table topper/wall hanging you made for your mom! Wonderful displays of your superpowers! You really are a queen of all trades. Those are great pieces. My superpower....hmmm...I love being a Supermom. Respect for your cross stitched projects, well, I tried once and never took it again, I don't know, perhaps I should try it another time when I am more relaxed, LOL. I love embroidery too, and therefore your quilts! All of your projects are beautiful. You have many superpowers. I guess my superpower is piecing. Trying to improve my others too. Your projects are all so beautiful. Your cross stitching is suburb. I appreciate your work and know that it takesa lot of time. Longarm quilting is my super power...cutting straight and sewing straight??? Not so much! Learning paper piecing so that may become a super power at a later date! Learning how to embroider, but I don't thing that will become a super power, but I'm trying! Love all your projects...especially mom's pillow - great job! Wow! 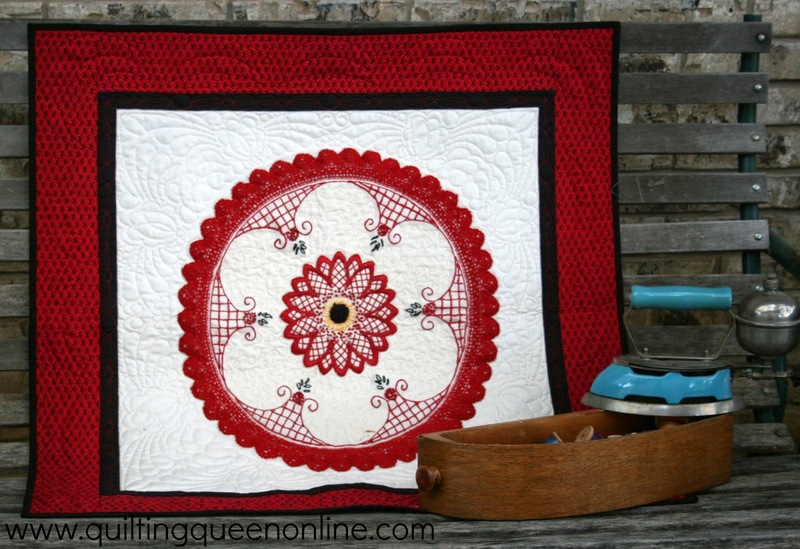 All of your projects are so beautiful, and your quilting is exquisite! What a treat! Gorgeous projects. Thanks so much for sharing with us all. Love your projects - especially the alphabet. My super power? I'm super-grammy. I can kiss a boo boo away and calm a crying grandbaby with the speed of a rocking chair! I LOVE to hand embroider! one of my fav is winter wonderland. I did mine in blue too! 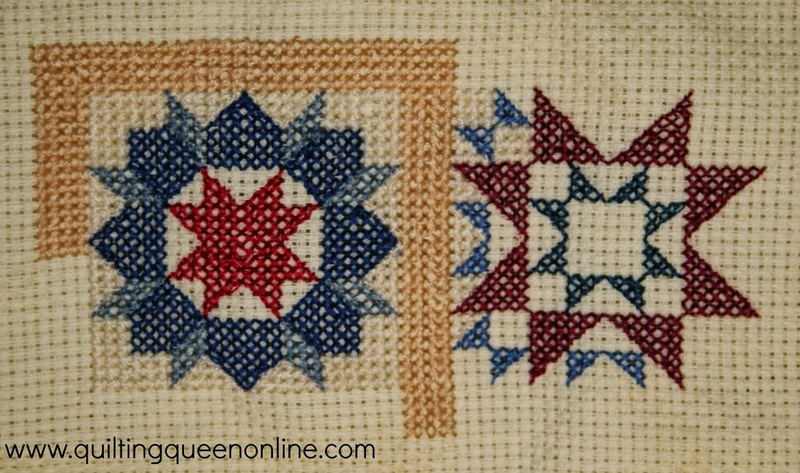 Love your counted cross stitch--which was my love for 20 years before I caught the quilting bug! Now, trying to incorporate them both. Like you I was a cross stitcher back in the day. Now I make quilts but your super power quilting takes the cake. Wonderful job. I think your superpower is beautiful handwork. It shows in your varied and wonderful projects. Congrats on being a pick of the day, very well deserved!! Your projects are stunning and your workmanship fabulous. Wow! Your quilt is gorgeous!! My super power, is super dessert maker. My dh has a bridge club that meets every so often in our home, and he loves that I will make the desserts to serve everyone! Mine currently is being messy. I can create a mess in a blink of an eye. I love your stitcheries. 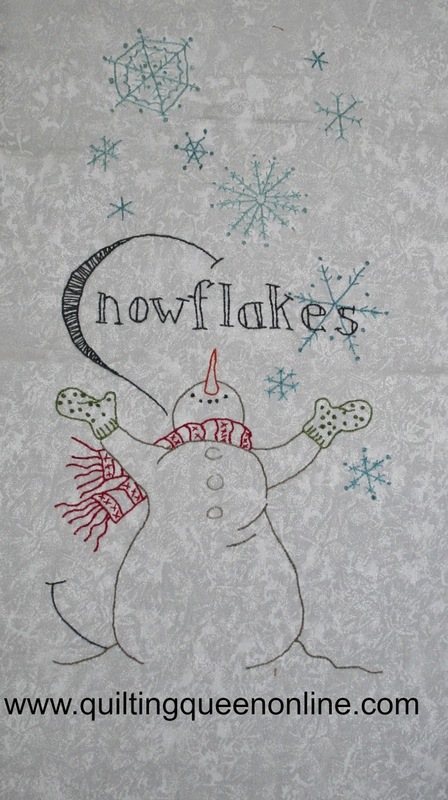 I can't tell you my superpower yet, you will have to wait till Monday, but I love all of your embroidery projects, especially the A-Z Snowmen, so cute and your quilting is a SUPERPOWER, amazing! Your work is gorgeous! I did a bunch of Paula Vaughan cross-stitch, too. Love it! My super power is cross-stitching, though I do a lot of other things, as well. maybe that will count. If not just delete this post, I would have shared anyways. My super power is being Nana to my wonderful grandkids. :) I have also done just about every needlecraft. Just started quilting and I love it! Your stitching is fabulous! thank you! 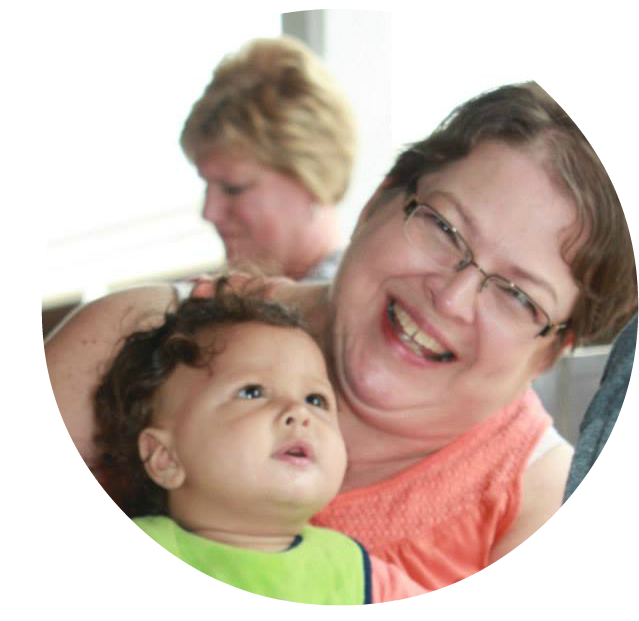 I think I have the Superpower of mentoring! I am always being asked for advise :) thanks! Your cross stitching is really lovely. I'm a jack of all trades. I've tried almost every creative field I know of. I don't know which I'm best at. I've never considered having a superpower! I am a music teacher so my super power would have to be music! Lol my super power is patience to rip the seams with seam ripper! 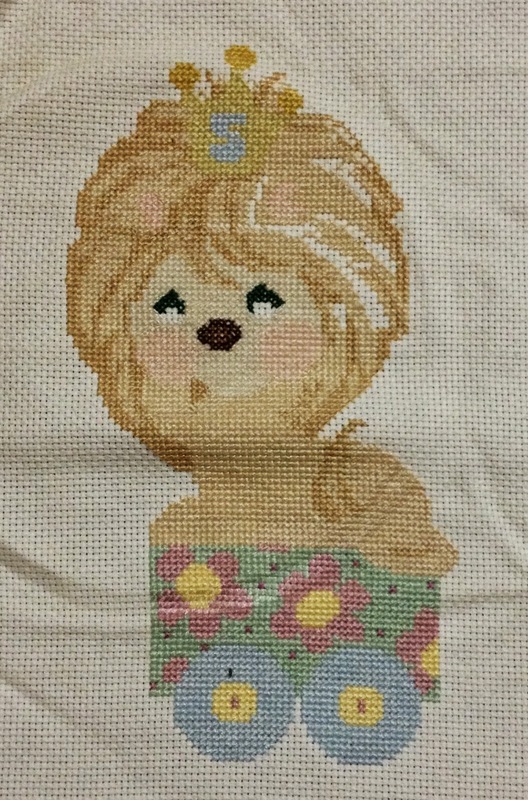 You are the queen of many stitches. What great superpowers you have in quilting. Just gorgeous. My superpower is reaching the realization that my arms/cart/basket/plans are bigger than is possible to accomplish in my lifetime. And the real question is whether I can muster up the superstrength to weed out and share potential "most wonderful in the world" projects. Wow...Love your projects...You are a super sewist!! I have just started back at sewing after quite a few years of owning my own flower shop. 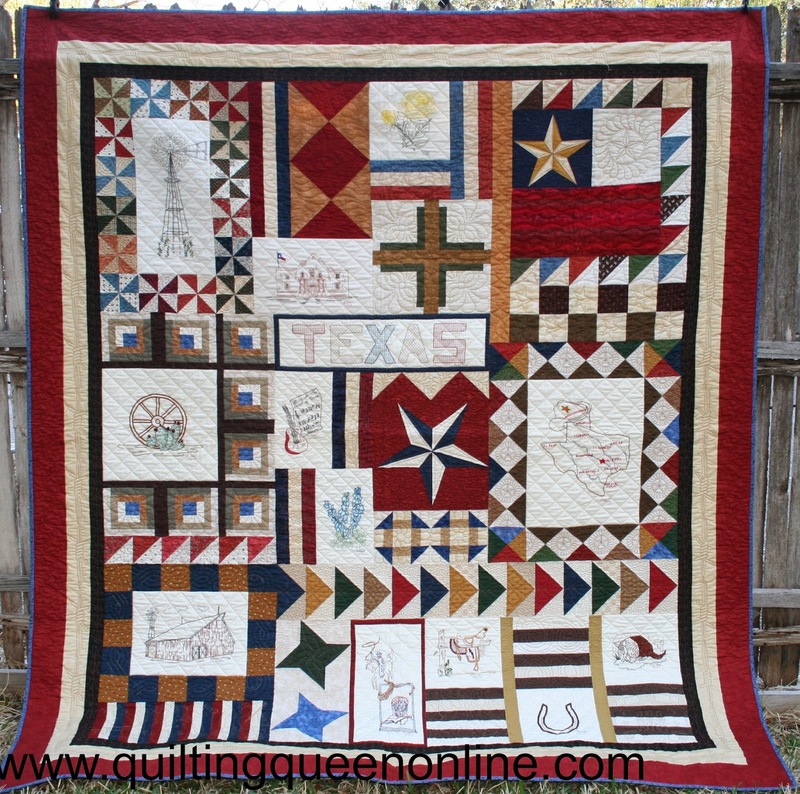 I love the projects I see on the internet and have made quite a few quilts and other items. I sew 2-4 hours every day. It is my sanity saver. Your superpower is anything that involves a sharp needle and thread. Love your cross stitch pictures, your embroidery, and your quilting. 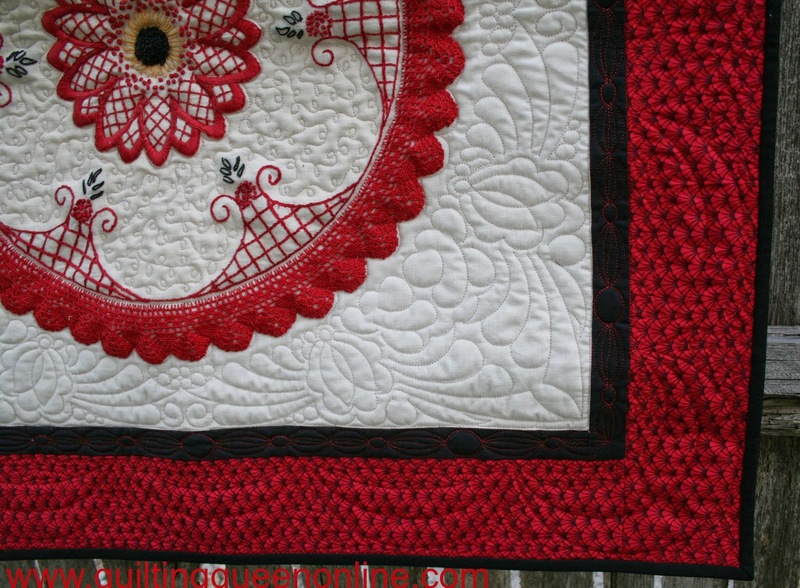 Your table topper/wall quilt is absolutely stunning and so very creative. I love Paula Vaughn designs! I did one for my my grandmother a few years ago. That quilt for your mom is beautiful. I don't know what my superpower is...that's why I didn't join this hop! Thanks for the chance to win. Well, when my children were younger I told them that I was magic mommy and would always know if their seatbelt wasn't on. And I did too-because I could hear the click when it was put on or taken off. I caught them a few times and after that they became reliable about seatbelts. So I guess my superpower is super hearing! Lovely work. I asked my husband what my super power is, and he said that it was reading him mind. LOL I often know what he is thinking. I don't think we like to list our strengths because we don't like to brag. I'm a good pie baker and a good quilter. I guess those would be my super powers. I don't think know it if I have any super powers but you certainly have several super powers. 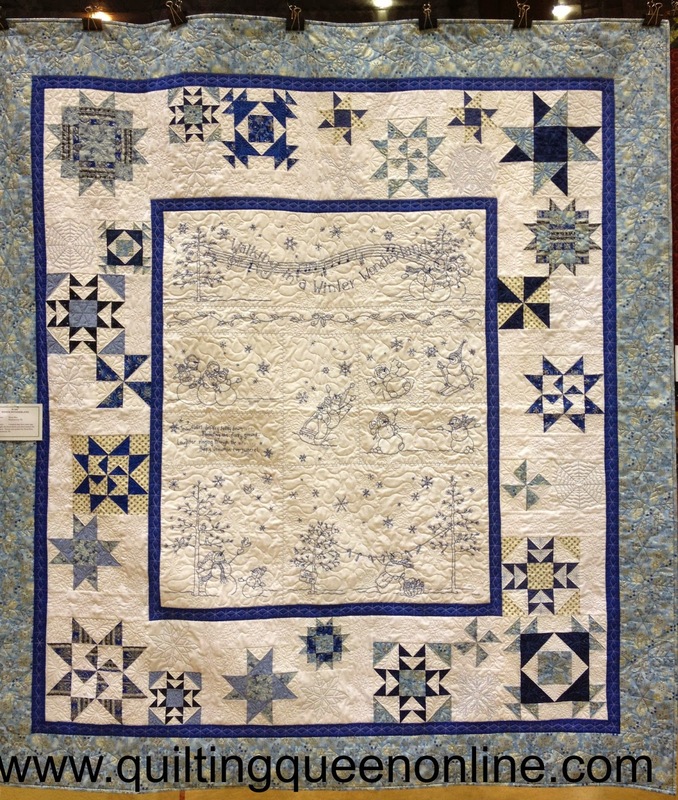 Beautiful stitching and quilting. What great projects! I want to get back to cross stitch again and I have some embroidery in the works. Mine pales in comparison with yours. Your work is beautiful. And I can see why you quilt - oh, my! Thanks for participating. WOW! You truly do have stitching superpowers!! All of your work is beautiful and very well done ... thank you so much for sharing!! I am a follower of yours on FB. As far as superpowers, I don't think I have any to speak of so I guess my lasting friendships with my peeps is the one I will claim. My longest time friend is Debbie and we have known each other since 1977, then there is Judy (my BFF, shoulda been sister) since 1986. WOW! Unbelievable work! So detailed! 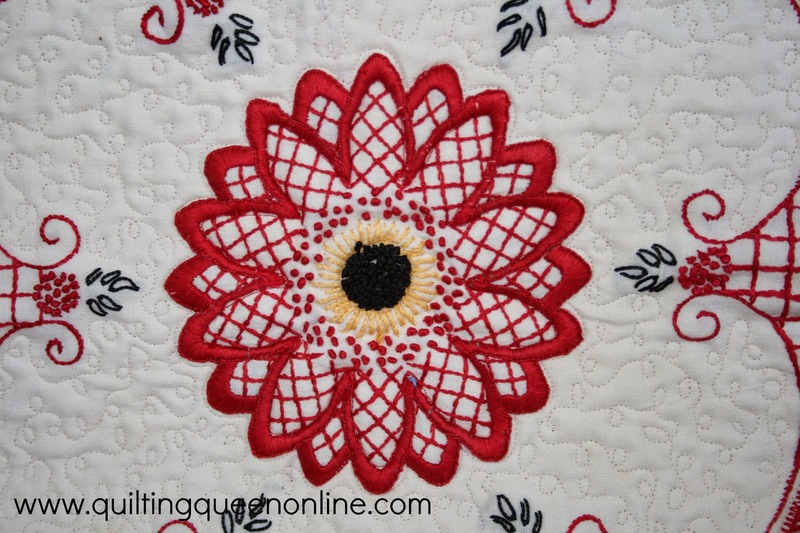 Your love for quilting is inspiring! You have wonderful superpowers and it shows. Great eye candy. Wonderful projects, past and present. I'm late getting around but not too late to enjoy your blog post. Thx for the giveaway opportunity. I couldn't really narrow it down but embroidery wins big around here. My super power is how I can finish something at the last possible second. I say it has to to with time warps... My husband says it's because I'm easily distracted. What does he know, anyway? ;P Thanks for the chance to win. I just started working on some cross-stitch this year and this looks really useful! I like your S snowman. Your project is pretty. I love your superpowers. I think my super power is that I am very flexible in my life ( not so much my body). I just go with the flow and change plans whenever it is necessary. For example, right now we are trying to set a date for our Easter dinner. Can't have it on Easter due to boys going to inlaws. So far has been set and changed 3 times. Just waiting for them to figure it out and I will cook. Thanks for the great blog and the chance to win. Your embroidery and cross stitching is super indeed! My superpower is that I survived braces! My superpower is I have is a green thumb. Following you on twitter @minibea.